It was becoming a two-man race between Hoffman and the Democratic candidate, Bill Owens, with Scozzafava serving as a spoiler to the third-party candidate. She read the tea leaves in her sinking poll number and dropped out. What was amazing was that the Republican county leaders, facing a GOP district, felt that they had to pick Scozzafava for their candidate. She isn’t even a moderate, she’s basically a Democrat. In fact, she was the most liberal candidate of the three. It’s one thing to pick a RINO in a liberal-leaning area like Maine. But why pick one in a GOP district. There must be some sort of backstory there that does not augur well for those party leaders. Besides Scozzafava, the big loser in all this is Newt Gingrich who had been going to the mattresses to defend his support for her. Meanwhile, Republicans have been following Sarah Palin’s lead and endorsing Hoffman. David Frum? Newt Gingrich? Peggy Noonan? Chris Buckley? David Brooks? Do you hear us now? They say an 8-ball of Colombia’s finest really gets you “in character” to pull this costume of! The White House is so shocked at Jake’s finding, they acuse him of calculator abuse. As if one needed a calculator to figure that one. Of course, it’s abuse because Jake isn’t buying the White House line. See! That makes it all right! Excuse me know for a moment. I need to go “save or create” some housecleaning and laundry. Video by No Sheeples Here. Go to Project Valour IT and contribute. Is a Pay Czar constitutional? Kenneth Feinberg hasn’t been confirmed by the U.S. Senate. So who is Kenneth Feinberg, and where did he get the power to set pay for executives at private firms? As part of the hastily enacted and seldom-read legislation establishing the Troubled Asset Relief Program (TARP), Congress authorized the Secretary of the Treasury to “require each TARP recipient to meet appropriate standards for executive compensation.” To carry out this task, last June the Treasury promulgated an emergency “Interim Final Rule,” waiving ordinary requirements for a public comment period. As part of this emergency rule, Treasury Secretary Timothy Geithner created the office of “Special Master” for compensation, delegated his TARP authority to set compensation standards to this officer, and appointed Mr. Feinberg (a lawyer and mediator) to this position, without obtaining Senate confirmation. Which, of course, he hasn’t. Otherwise he wouldn’t be a “czar”. Congress and Congress alone has power to dispense with the safeguard of the confirmation process. Maybe it’s time one of those executives sues. My latest article, Governor’s Race Neck and Neck in High Tax New Jersey is up at Pajamas Media. Please read it an leave a comment. Afterwards, Mr Micheletti announced that a power-sharing deal had been reached that included a “significant concession”. “I have authorised my negotiating team to sign a deal that marks the beginning of the end of the country’s political situation,” the interim leader told a news conference. “With regard to the most contentious subject in the deal, the possible restitution of Zelaya to the presidency” would be included, he said. Mr Zelaya described the accord as a “triumph for Honduran democracy”, and said he was “optimistic” of returning to power. 1. The creation of a reconciliation government. 2. Rejection of political amnesty. 3. Recognition of the November 29 elections. 4. Transferring control of the Armed Forces from the Executive to the Supreme Electoral Tribunal. 5. Creating a verification commission to enforce compliance with the agreement. 6. 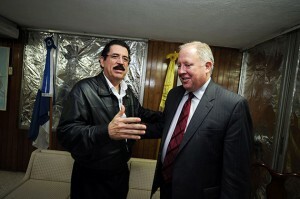 Creating a truth commission to investigate the events before, during and after June 28, the date of Zelaya’s removal. 7. Requesting that the international community end all sanctions against Honduras and that they send in observers to the presidential election. 8. Supporting the proposal for a vote of the National Congress with the approval of the Supreme Court of Justice to reinstate all the Executive Power prior to June 28, that is, restoring Zelaya to power. Both sides signed the agreement. Worst news of all: supposedly Thomas Shannon has been pressuring the congressmen to vote for the restoration of Zelay or else! The exact words were that “Shannon scared the living hell out of everyone here including Micheletti.” Yeah, remember the press conference? “We’re just here to help. We aren’t going to intervene. We’ll respect any decision that the Hondurans make.” Yeah, right. Now they are even threatening elected Honduran officials that they won’t recognize elections unless they vote yes. I’m sure there must be economic threats as well. El Heraldo (in Spanish) makes it clear that US State Dept. envoy for Latin America Thomas Shannon went to Honduras to twist arms: his position was that the November 29 elections would not be recognized unless Zelaya was returned to power. I guess nothing ensures democracy like restoring to power the guy who did his outmost to undermine democracy, at least in Shannon’s eyes. 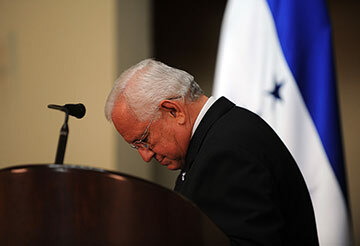 Related reading: Who’s behind the Obama Honduras policy? 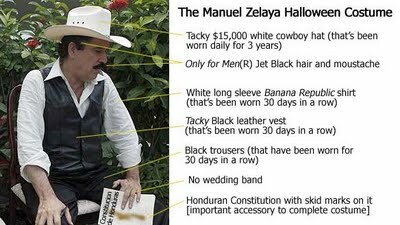 Honduran Government Succumbs to the Obama Administration’s Pressure, Fellow Marxist Manuel Zelaya Will Be Returned to Power…..
A Settlement is Achieved in Honduras. Elections to be Respected, Zelaya’s future uncertain. The U.S. embassy in Honduras did yeomen’s work watching out for the interests of the Zelaya clan, leaving many to wonder which side it was pulling for. In short, against a small, friendly, anti-Chávez ally, the administration mustered the sort of muscle it would never dare use against Iran, Russia, or Venezuela. The accord requires implementation by the Hondurans, good behavior by Zelaya, and a quick infusion of international support for the elections. It requires hands-on U.S. diplomacy, not pre-June 28 complacency, to make sure Zelaya doesn’t yet derail the electoral process and steal Honduras from under the eyes of the Obama administration. Post re-edited to correct a broken link. Blog reaction roundup will be updated through the day. And that’s their birthday dance, too.